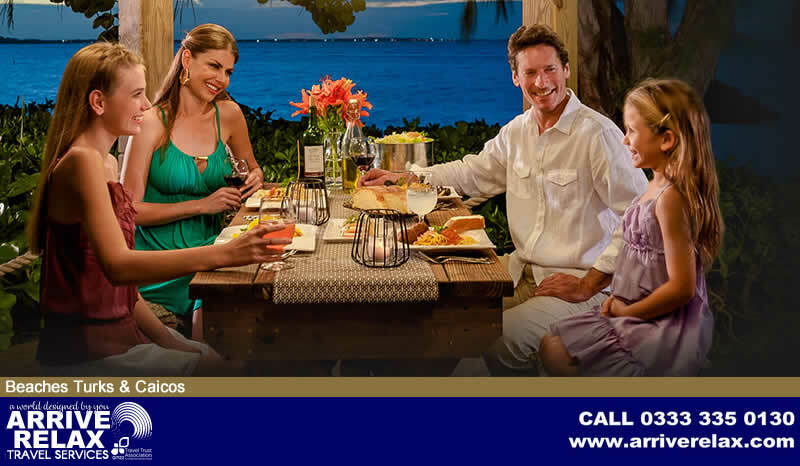 Your perfect family getaway awaits you at Beaches. 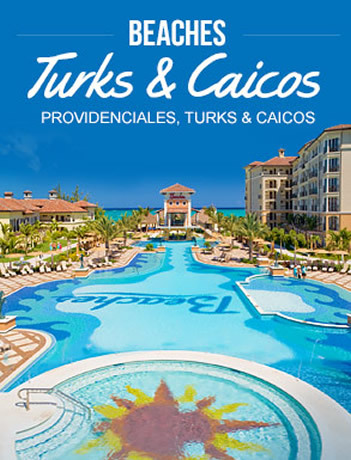 Your perfect family getaway awaits you at Beaches all inclusive Resorts in Jamaica and Turks and Caicos. Play on pristine, white-sand beaches caressed by crystal-clear seas. Spend your family holiday in luxurious rooms and suites. Enjoy a whole array of incredibly exciting and fun activities for kids of every age. 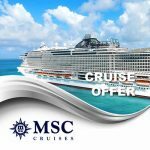 Truly, Beaches Luxury Included® holiday package deals in Jamaica and Turks & Caicos promise unforgettable family fun beneath the Caribbean sun. 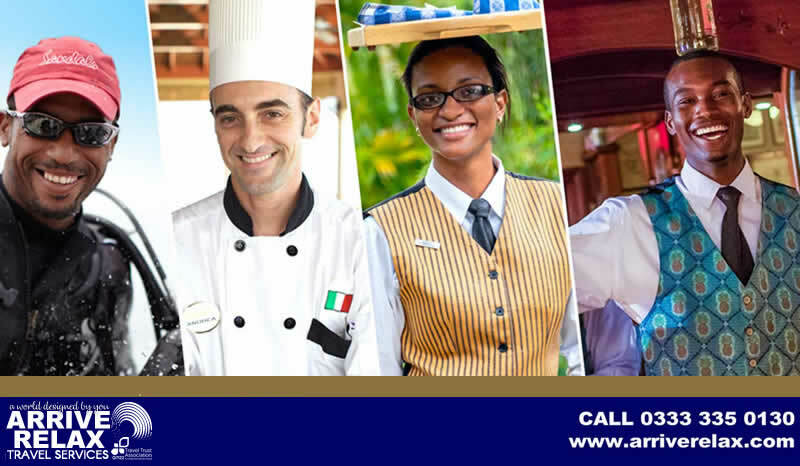 To be the very best requires creativity, commitment, and constant innovation-all things we do very well at Beaches Resorts. And that’s why, year after year, Beaches is proud to have been showered with some of the most prestigious awards and accolades from renowned consumer and travel publications. 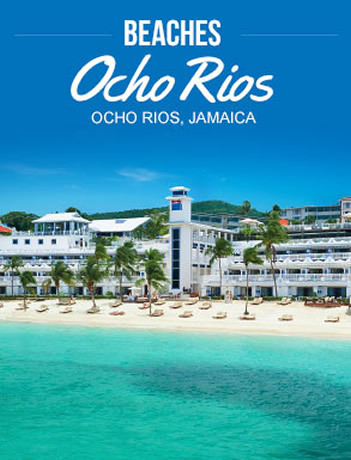 Beaches all-inclusive beach resorts are always set along the most beautiful, unspoiled and alluring white-sand beaches in the whole Caribbean. You’ll also find them located on the calmest, most protected shorelines—and that’s completely by design. Where surrounding canyons of live coral reefs soothe the tides and gentle trade winds provide a cooling respite from the sun. Beaches are proud to be the safe keepers of these pristine environments, so it’s only natural that each resort has been awarded with the internationally coveted Earthcheck Certification. 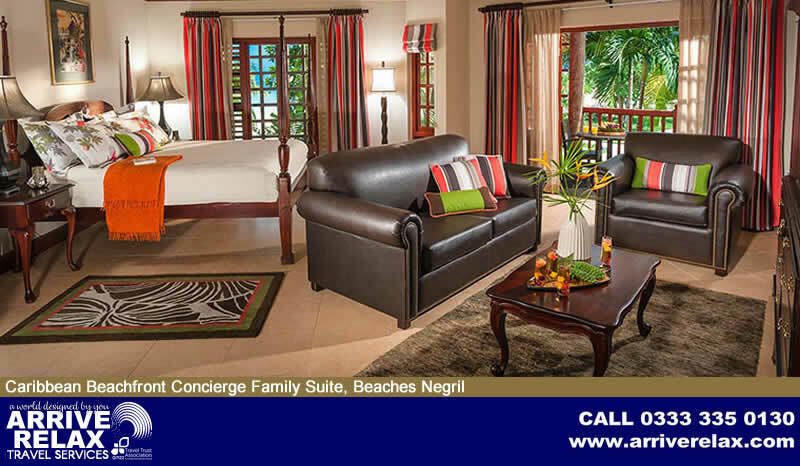 Discover the most innovative and luxurious rooms and suites at Sandals Resorts. Created in the spirit of opulence with separate sitting areas and a dedicated concierge team, these luxury accommodations are perfect for couples in love. From dramatic cliffside villas with spectacular 180-degree views to lavish Skypool Butler Suites with personal butler service and infinity-edge plunge pools, Sandals Signature Accommodations are sure to elevate your romance to new heights. BUTLER ELITE The unprecedented Butler Service, only available in the very highest level of suites, provides the most discerning guests with an unimaginably supreme standard of service and luxury, where your every need is anticipated. BEACHES CONCIERGE The exclusive Suite Concierge Service is a Beaches Signature amenity included for all Concierge level rooms and suites. The inclusions are the same as our Luxury rooms, plus mahogany four-poster beds, sitting areas, full bath, in-room bar (fully stocked) and his & her robes. TOGETHER NEST SUITES Beches have designed these one-of-a-kind accommodations with both couples and families in mind. The Beaches exclusive Together Nest Suites® feature thoughtfully selected details, world-class amenities and personal butler or concierge service for the ultimate get together getaway. INCLUDED 5-Star Global Gourmet dining at Beaches Resorts is an all-inclusive dining experience the whole family can enjoy. With as many as 21 unique restaurants per resort and as many as 22 culinary concepts, you’ll enjoy a level of variety, quality and creativity that’s simply unmatched anywhere in the Caribbean. Even if you’ve never dived before, our PADI® Resort Certification Program (nominal fee applies) will have you experiencing a whole new underwater world by the very next day – with all the instruction and equipment you needed. Even kids can learn about the underwater world of the Caribbean, with a variety of PADI® programs developed to teach them about scuba diving and preserving the underwater environment. Kids Scuba programs are available for an additional cost. 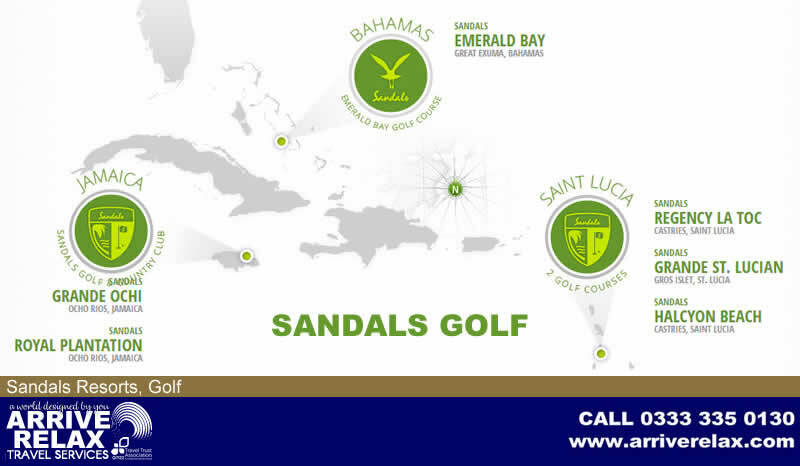 Beaches offers some of the most challenging golf in the Caribbean on a prestigious championship course in Jamaica. 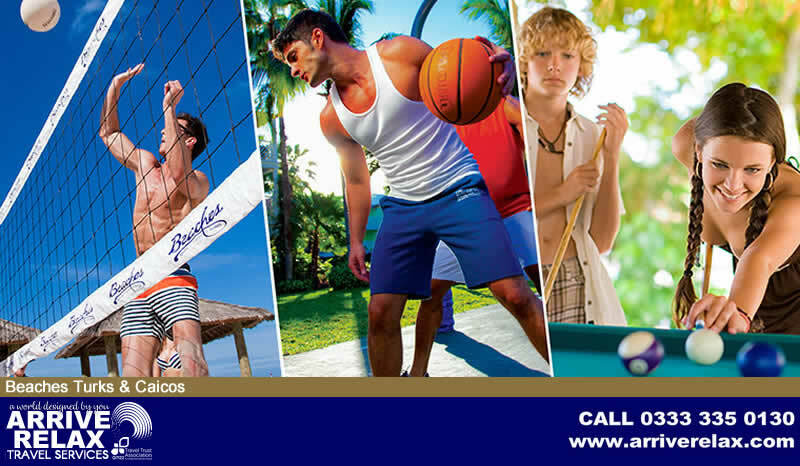 Beaches has got everything down to a tee for every level of skill, even for those who want to take their very first shot at it. Best of all, you can play round after round without paying for any green fees and even round trip transfer fees are included*. Anyway you slice it, no other resort includes more. From tots to teens, Beaches offers activities for all ages. At Beaches all-inclusive family resorts in the Caribbean, they give kids extra attention with tailor-made fun just for them. Beaches includes supervised kids programs for five different age levels, and they never charge extra for giving kids the extra special excitement they crave. Pirate Island Waterpark | Sesame Street® | Kids Camp | Xbox Play Lounge | Junior Golf Club | Kids Scuba Program PROFESSIONAL NANNIES All nannies and Kids Camp staffers at Beaches Resorts are members of the International Nanny Association, America’s oldest and largest in-home child care association (After hours care for infants and kids at additional cost). SESAME STREET Beaches brings families together to make dreams come true at the Caribbean Adventure with Sesame Street ®. Meet up with Elmo and Zoe for stage shows, parades, character breakfasts, nighttime tuck-ins and more. CHOO CHOO TRAIN Enjoy the scenery on the tropical Choo Choo Train that takes you through the piazza of the Italian Village, the chateaux of the French Village, and the gardens of the Caribbean Village (Available only at Beaches Turks & Caicos). 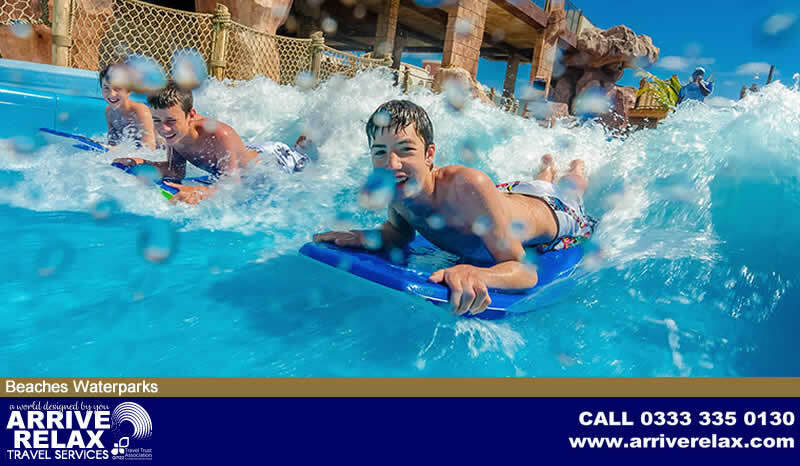 Only Beaches has the biggest waterparks in the Caribbean, where kids of all ages will have a blast. Pirates Island is a fantasy world filled with gigantic waterslides, kid-friendly pools and swim-up soda bars. 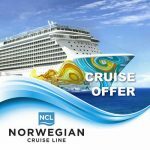 There are also water cannons, whirlpools and lazy river journeys, as well as the Caribbean’s only surf simulator (at Beaches Turks & Caicos). 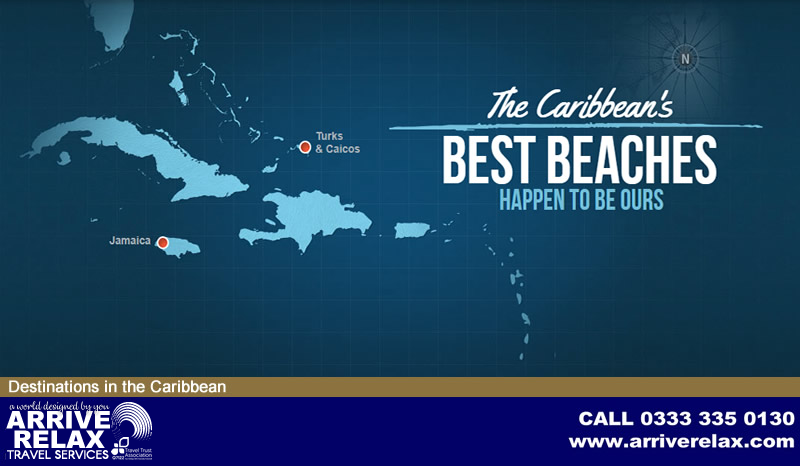 At Beaches, enjoy the pleasure of luxury and comfort that is above and beyond the norm. You’ll find the commitment to service excellence is expressed in countless ways-from the first welcome of champagne service and cooling towels, to the extra special touches of the butlers. 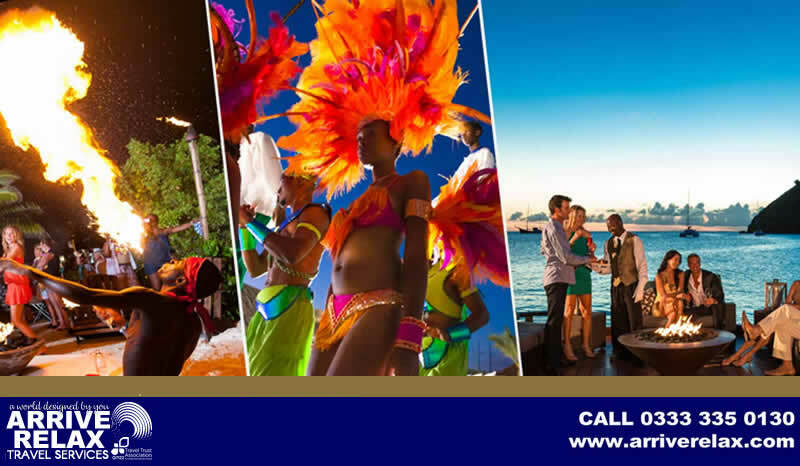 Experience the pinnacle of personalised service at Beaches Resorts and enjoy industry-leading, uncompromising standard of hospitality every waking moment of your stay. Airport Lounge Surround yourself with timeless elegance and refined style before you even reach your Luxury Included®destination with the Sandals & Beaches Exclusive Airport Arrival Lounge in Jamaica. 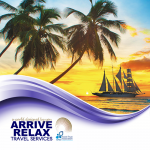 Direct Transfers Relax and enjoy your stress-free direct roundtrip airport transfers. Or opt to arrive in style in a luxurious vehicle from the Beaches fleet with a first class, private luxury transfer, which is available for an additional cost. The all-inclusive Beaches Resorts offer Luxury Included Vacations® where kids and grownups alike can do as much—or as little—as they want. Vacations at these all-inclusive family resorts in the Caribbean are all about you, and taking the time to relax, unwind and spend quality time together with loved ones. Voted among the Top 10 Best Beach Resorts by Parents magazine. 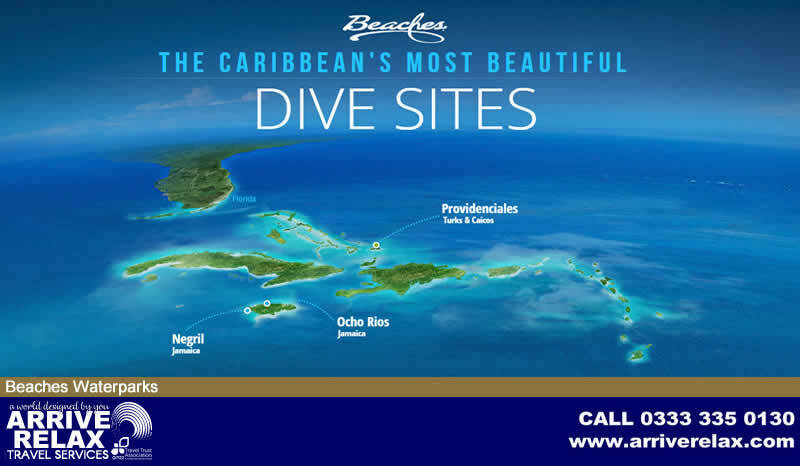 Twenty-two acres of lush tropical gardens, a gorgeous private white-sand beach, 6 gourmet restaurants, 3 fantastic swimming pools, a dedicated scuba practice pool and an entire ocean of watersports are just a few of the places and things to explore. 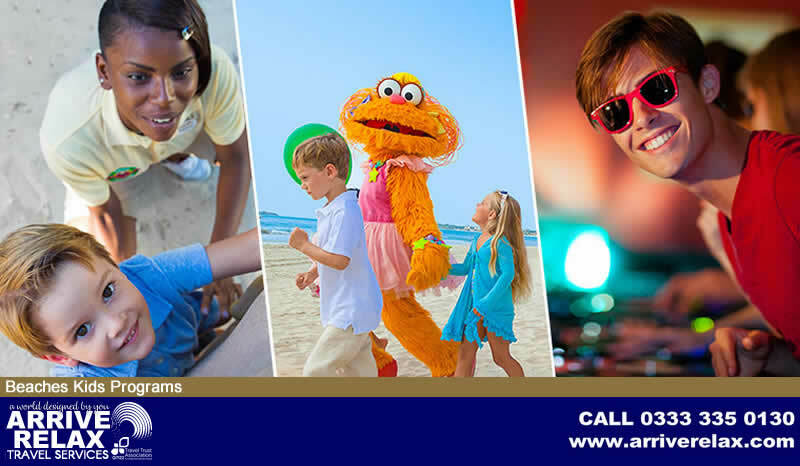 Plus, only at Beaches Ocho Rios, families can meet Oscar, the resident Grouch from Sesame Street®, and participate in the From Trash to Treasure activity and join in at Oscar’s Sing-A-Long pre-show… all part of the Beaches Resorts’ Caribbean Adventure with Sesame Street®. 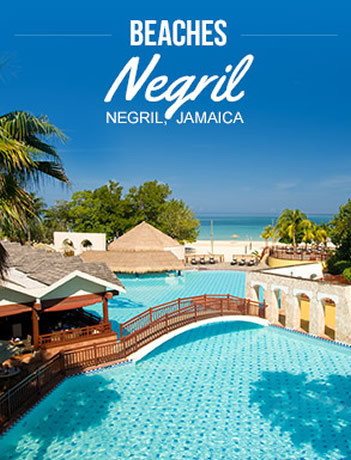 Negril invented “chill” – so get ready to embrace the laid-back spirit at this low-rise resort perched along Jamaica’s famed Seven Mile Beach. From the moment you enter the open-air lobby you’ll be caught up by fresh ocean breezes and the vibrant colors of the West Indies. Bringing the outside in, this all inclusive resort and spa in Negril, Jamaica is always open to the breathtaking beauty of the tropics. The vibe here is totally carefree and about spending time with those you love.